I was unsure what to post for my non-bug day (had you noticed I was alternating bugs then non-bugs?). 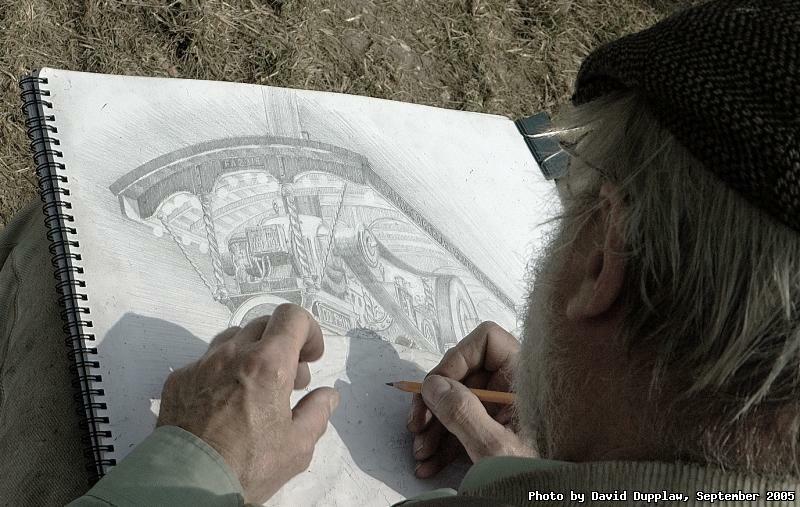 This old guy was drawing an amazing sketch of one of the show engines at the Great Dorset Steam Fair. I really admire people who are able to draw so well. Taking photographs certainly has some skill to it, but this kind of work is in a different league altogether, in my opinion. I really like bright, deep colours, but I felt this picture looked better desaturated somewhat. I felt rather guilty taking this photo, because he was clearly putting alot of work into it, and I pop over his shoulder and take a photo of it. I knew I was not taking it for the picture, but for the photo (if you see what I mean), but I felt like others must have thought me rather rude.